Pros • Zigbee & Z-Wave radios for H.A. Read this review of Almond+ Home Automation features. A little over two years ago, I reviewed Securifi's Almond - a simple, but relatively expensive N300 router that featured a unique touchscreen that allowed you to set up most, but not all of the router's features. Fast forward two years, and Securifi has two new products: The Almond-2015 and the Almond+ I'll be reviewing today. The chart below, taken from the Securifi website, summarizes the three products. Compared to the original product, the Almond+ features four Gigabit Ethernet ports, a larger 3.5" LCD touchscreen, two USB 3.0 ports and built-in ZigBee and Z-Wave radios that support an entire range of home automation products. As an AC1750 class router, it supports simultaneous dual band operation and has 3X3 radios on each band. The other two products are single band N300 (2X2) class products. 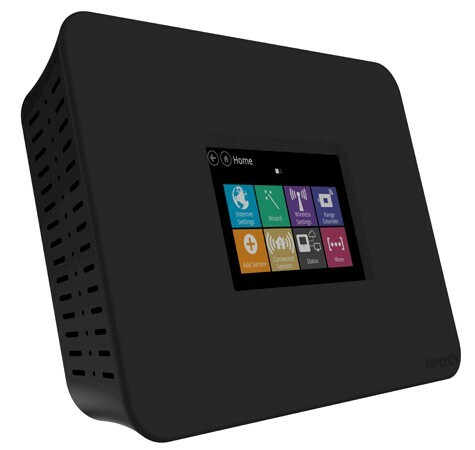 The Almond+ has two unique selling propositions that differentiate it from other AC1750 class routers. First, like the original Almond, it has a color touchscreen. The touchscreen on the Almond+ is a 3.5" 480 X 320 pixel screen vs. the 2.8" 320 X 240 pixel screen found on the other two models. This allows for eight "metro" or "modern" styled icons on the screen of the Almond+, compared to 6 on the other two models. Using the touchscreen, you can completely configure the basic setup as well as most of the router's features. Likewise, the browser-based interface, which many customers will never use, also lets you configure the router. Interestingly, there are some features that can be configured only in the web UI and some features that are only configurable using the touchscreen interface. The Almond+ has additional advanced features available by using an OpenWRT interface found on the Advanced page of the web UI. Second, the Almond+ has built-in ZigBee and Z-Wave wireless interfaces that support a large number of Home Automation devices such as door locks, security sensors, thermostats, smart LED bulbs and power sockets. In order to support those devices, Securifi has built its own back-end services as well as Android and iOS apps. These Home Automation features are covered in this review. Securifi took a slightly different design direction with the Almond+. First, the black plastic molded case on the Almond+ has a nice matte finish, which helps hide fingerprints. The original Almond had a glossy finish which seemed to attract fingerprints. Second, while the original Almond was intended primarily as a desktop router and sits vertically, the Almond+ tilts back at an angle and is supported by a plastic kickstand that snaps on with two tabs. I found that the angle made it easier to use the touchscreen - similar to the experience you have with a tablet. Securifi includes a stylus tucked into a slot in the router top that comes in handy to operate the touchscreen. Also included is a plastic back plate for wall mounting that snaps into the same holes the kickstand uses. On the rear of the Almond+, you'll find four Gigabit Ethernet LAN ports (black) and one WAN port (gray). Each port has a single green LED to indicate link status and activity. The network ports, like the two USB 3.0 ports and the power jack, are mounted so that cables plug in vertically from the bottom of the router. It's a bit difficult to connect Ethernet cables to several of the ports with the support bracket attached. You really need to remove the kickstand to insert or disconnect cables, and even then, it's awkward. Like the original Almond router, there isn't a user's manual for the Almond+. I contacted Securifi tech support with several product questions and they were very helpful. They pointed me to the Securifi Wiki, where you'll find pages dedicated to the Almond+, including an expanded Quick start guide, a number of "How tos", USB Printer Support and SSH Access. In looking through the Wiki pages, I found the hardware reset button, shown below. Initially, I had thought that the button might have been for WPS, but the Almond+ doesn't currently support WPS. That may be added in a future firmware release and could appear as a touchscreen button. The Almond+ is based on a Cortina Systems CS7542 dual core Cortex-A9 SOC running at 750 MHz. It has a built-in Wi-Fi processing engine, so the main CPU is freed for other tasks. The Gigabit Ethernet switch is built into the SoC a QCA8337. There's 512 MB of Samsung DDR3 RAM and 512 MB of Spansion Flash. The 2.4 GHz radio is an Atheros AR9580 and the 5 GHz radio is a QCA9880-BR4A 3X3 802.11AC radio. The power amplifiers for both 2.4 GHz and 5 GHz are unidentified from RFAxis. The FCC ID internal photos show a clean, but chock-full design. The first photo shows the placement of the three dual-band Wi-Fi antennas as well as the locations of Z-Wave and ZigBee antennas. The next photo shows the top of the main PCB with heat sinks and RF shields removed. The LCD panel plugs into the connector on the photo's right side. The last image shows the bottom of the main PCB with a substantial heatsink and cooling pipe. The pipe connects to a heatsink on the other side of the board that you can see in the first photo. It has a blue insulator/spacer attached to it. I did observe that the top of the case near the air vents was fairly warm to the touch. Key components are summarized in Table 1.